Oman Air France has been awarded for its continued contribution to the development of tourism in the Sultanate. 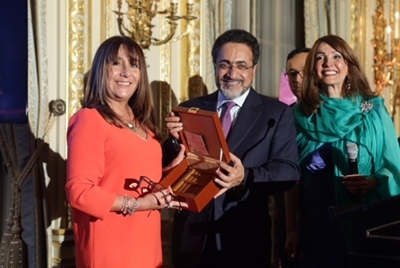 The award was presented to Rocio Jolivet, Country Manager France by the Oman Minister of Tourism H.E. Ahmad Al Mahrizi at the prestigious Oman Workshop in Paris on 14 March. The Oman Workshop in Paris was created to help promote Oman in France. The event was attended by a number of VIPs, including the former French President Francois Hollande, and more than 160 travel agencies. The Omani delegation was headed up by DG Salim Al Maamari and comprised of 26 partners including hotels and DMCs. Five awards were presented at the event – two for the best-selling resorts, two for the media and one in recognition of Oman Air France for its efforts in promoting the Sultanate in France. Oman Air takes its role to promote Oman to overseas markets very seriously and the airline’s team in France were proud to be recognised for their efforts in advancing tourism to their home country. Oman Air is no stranger to awards, last year alone the airline won four World Travel Awards, Seven Stars Luxury Lifestyle and Hospitality Awards, Skytrax World Airline Awards and the Frontier Awards recognising its inflight retail. As Oman Air continues to invest in its on-board product, network and fleet expansion and crucially this month its move to the new world class terminal at Muscat International Airport, there is no doubt there will be more accolades to come in 2018.